About the Book: A family visits the local farmer's market to stock up on fresh fruits and veggies. 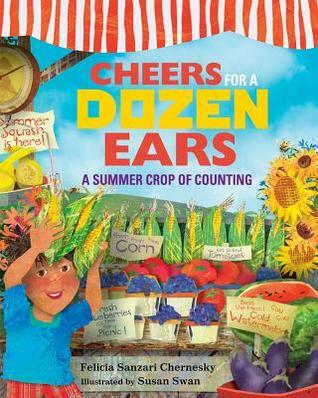 Cheers for a Dozen Ears is the perfect book to add to my food themed storytime. It pairs wonderfully with Rah, Rah, Radishes. You can even add in the board book We're Going to Farmers Market for a full storytime about fresh foods. With rhythmic, rhyming text, the kids make sure to get all the items on their list. From eggplant to squash, peaches and green beans, the family counts as they add items to their cart. The bright colored illustrations capture the feel of a hot summer day. A fun book that incorporates counting and food that makes a nice addition to storytime.